This activity is Saturday 26 August— tomorrow!! I’ve decided to donate the remainder of Eli Leon’s materials to you, the local art and quilting communities. It would be lovely and fitting to see some of what Eli amassed over 50 years of collecting have a new life in your artwork and quilts. I know he would love this idea if he could still understand! There are mounds and mounds of fabric, clothing, and clothing fragments, much of it vintage, plus some quilt fragments and blocks. There are also other things for the taking: shelves and miscellaneous practical items. Please forward this notice to your quilt guilds and artist friends! Stop by 5663 Dover St in Oakland Sat Aug 26th from 11AM – 2PM. As discussed at our last couple meetings, we will alternate where we meet, still on the last Tuesday of every month, except December. The August meeting will be at 6:30 pm at Hello Stitch. (The September meeting will be at Bay Quilts). Make triangle and other blocks without templates and marking; see what happens when you embrace the imperfections and irregularities of human hands. Sujata’s method of cutting in layers and organic piecing is unique, fast, and fun and combined with her piecing techniques, mimic the appearance of block prints of India. You’ll learn how adding curves to cutting, sewing, and the final trimming of blocks make the quilt-making process engaging and unpredictable until the last stitch. Each block you make will be different than the next in size, shape, and form, yet there will be overall harmony and balance to the quilt you make. You’ll also learn about the origins of the blocks, stories behind the quilts Sujata has made, and discussions on color combinations, textures, and quilt layouts during class. This workshop can be taken independently or as a continuation of Saturday’s workshop (see Saturday workshop description)–don’t worry if you don’t take the Saturday, workshop, you’ll be able to jump right in as Sujata introduces more free-form blocks and shares her process and techniques for making these imperfect and irregular blocks. You’ll have so much fun, you won’t want to stop making these organic, free-form blocks. I’ll be there both days. If you have question, you can ask me. 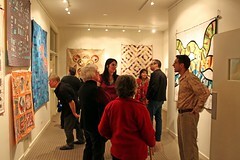 The quilt on the left is by Fern Royce. She was hand quilting it during the meeting. She plans to finish it in time for her show on 7/2. On the right is her show announcement. Photos from the June meeting. 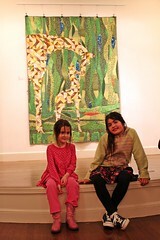 Here is Kirsten Hoseman’s quilt, during show and tell. I missed the last two meetings. Lots of things are happening. Starting with the August meeting, we will alternate where we meet. In August we will meet at Hello Stitch, 1708 University Ave in Berkeley. Then in September, we’ll be back at Bay Quilts. If you have an easily transported chair, you might want to bring it. Hello Stitch has fewer chairs than Bay Quilts. 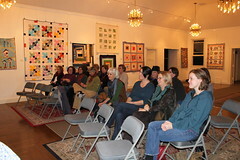 We discussed the pros and cons of merging EBMQ with EBHQ (East Bay Heritage Quilters). We’ve lost our insurance for our show, Stitch Modern. So to solve that problem, we could officially join the Modern Quilt Guild, or we could join forces with EBHQ. We discussed this a few years ago, and chose then to do neither. Now with the insurance issue, we’re talking about it again. EBHQ is willing to change their name, and drop the “heritage” part. This isn’t as surprising as it sounds since EBHQ has more art quilters and modern quilters in it than heritage quilters. 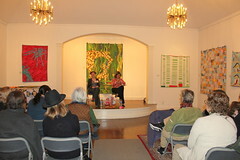 Fern Royce has a show with multi-media artist Linda Race at Sweet Adeline Bakeshop. It’s at 3350 Adeline St in Berkeley from 7/2 through 7/30. 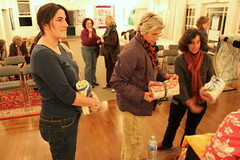 Hi, this is Claire posting a few notes from tonight’s meeting at Bay Quilts. On the card for Stitch Modern there’s a mistake. The date for the community sewing day is correct, April 9, but the card says it’s a Friday, but it’s actually on Sunday. 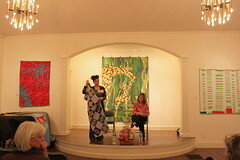 The lecture, with Kathryn Clark and Sara Trail on April 21, won’t be in the gallery with our quilts, but in a meeting room in the back, right hand side of the building, near the restrooms. 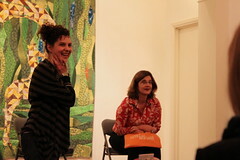 There are 5 spaces left in our workshop with Maria Shell on April 22. Please come to the opening of Stitch Modern on Friday April 7 at 7 pm at the Piedmont Center for thr Arts, 801 Magnolia Ave, Piedmont, CA. Here’s a few more photos from tonight’s meeting. Next meeting is March 28. 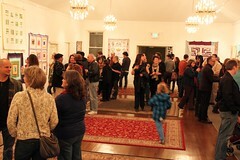 We’ll meet as usual on March 28 at Bay Quilts, at 5327 Jacuzzi St, Suite 3-C, Richmond, CA 94804, from 6:30- 8:30 PM. 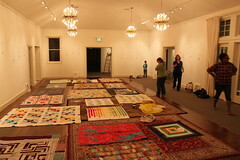 This is the time to bring and drop off your quilt/s for Stitch Modern. 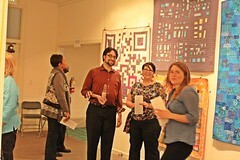 The deadline to register your quilt online for Stitch Modern is this Thursday, 3/23. Click here for the link to the online form. If you’ve never been to EBMQ before, don’t be shy, come and introduce yourself. Bring your latest project for show and tell, or just come and hang out! From Sue Fox— FYI— This Tuesday evening at the San Francisco Quilters Guild— $5 entry fee for non members. SFQG meetings are held the 3rd Tuesday of most months and are held the San Francisco Chinese Seventh Day Adventist Church at 7777 Geary Blvd, cross street 42nd Avenue, San Francisco, CA. Meetings begin at 7:00 p.m. However, it is a tradition for members to come early to socialize, browse our extensive library, or check out the various activities. Doors open at 6:30.